although I did make ONE drawing (see below). 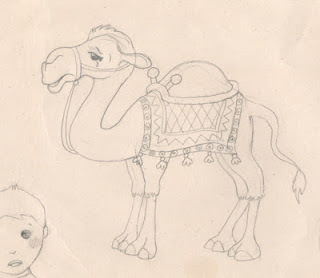 This is my first ever camel! Sort of to get the feel of drawing this strange humped creature. but Google is a great help in sticky situations! it looks much better in person. but ended up using it here. It's painted satin, cut out and edged with cord. although you don't see the colors much in these pics. Good Luck inscribed on it.